How is the Jesuit mission reflected in today’s undergraduate and graduate business programs? This issue of Connections focuses on seven Jesuit colleges and universities incorporating justice themes into their curricula; opening new centers for ethics; leading faculty seminars on Ignatian readings; and much more. It is an exciting time for Jesuit business education, and we are thrilled to share the stories of these schools with you. The Association of Jesuit Colleges and Universities (AJCU) hosted the 20th annual AJCU Federal Relations conference from October 3 – 4 on Capitol Hill. The conference was well-attended, with 37 representatives from Jesuit colleges and universities. This year’s conference focused on student financial aid, with a particular emphasis on the Perkins loan program, and updates related to the Dream Act and Deferred Action for Childhood Arrivals (DACA) program. Business is a career and a calling. It is the Ignatian heart of the Jesuit business school. 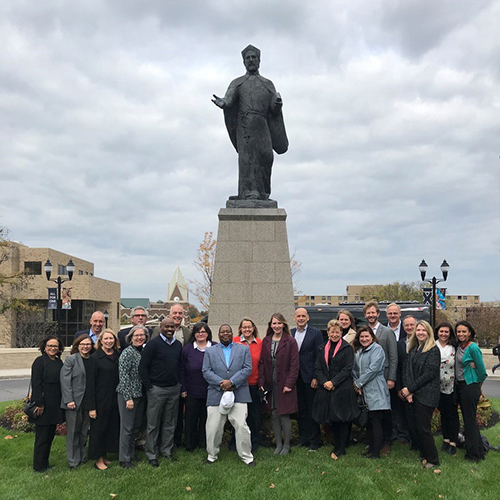 The John M. and Mary Jo Boler School of Business at John Carroll University embraces our mission of education for leadership and service in the Jesuit tradition. It inspires our vision to graduate students who live inspired lives. In 2010, the faculty and administrators in what is now the Madden School of Business at Le Moyne College were asking themselves a question: In the wake of the Great Recession and multiple serious, well-publicized ethical breaches at some of the world’s most renowned companies, how could they best prepare their students to be reflective, ethical leaders, men and women as concerned about values as growing a company’s value? The answer they came to was this: They would cultivate those individuals by leveraging the intellectual capacity, moral authority, and rich history of the world’s nearly 200 Jesuit institutions of higher education. From conserving water and expanding solar power, to incorporating environmental and social decision-making into investment decisions, Loyola Marymount University’s (LMU) commitment to ethical leadership, sustainability and social responsibility is well documented.And now, this fall, LMU’s College of Business Administration will launch the Institute for Business Ethics and Sustainability (IBES) – further bolstering the University’s dedication to these guiding principles. Marquette University integrates experiential learning into its curriculum with the Jesuit emphases of empathy, diversity and justice. It’s such a priority that Brian Till, Marquette's James H. Keyes Dean of Business Administration, is offering mini-grants to faculty members who restructure their classes in a way that encourages their students to learn by doing. In his 2013 apostolic exhortation, Evangelii Gaudium (“The Joy of the Gospel”), Pope Francis called for an examination of the purpose of business and a prioritization of the common good. Though academic and business communities have been making such appeals since the modern business ethics movement began in the late 1970s, there is, according to John McCall, Ph.D., director of the Pedro Arrupe, S.J. Center for Business Ethics at Saint Joseph’s University, still much work to be done. It is impossible to walk through the University of Detroit Mercy’s Commerce & Finance Building, home to the College of Business Administration, without noticing tangible signs of faith that help to create an atmosphere conducive to spiritual reflection and consideration of the greater good. But the College’s Catholic identity goes far beyond the physical environment. It is evident in the mission statement, which emphasizes the Jesuit and Mercy traditions of our founders, service to society, and spiritual, ethical, and social growth — as well as academic excellence. What does it mean to be a Jesuit business school? How can the scholarly output of business faculty contribute to the Jesuit mission? These were some of the questions examined by a small group of faculty in the Kania School of Management (KSOM) at the University of Scranton, who recently took part in the Business Education for Justice Seminar.